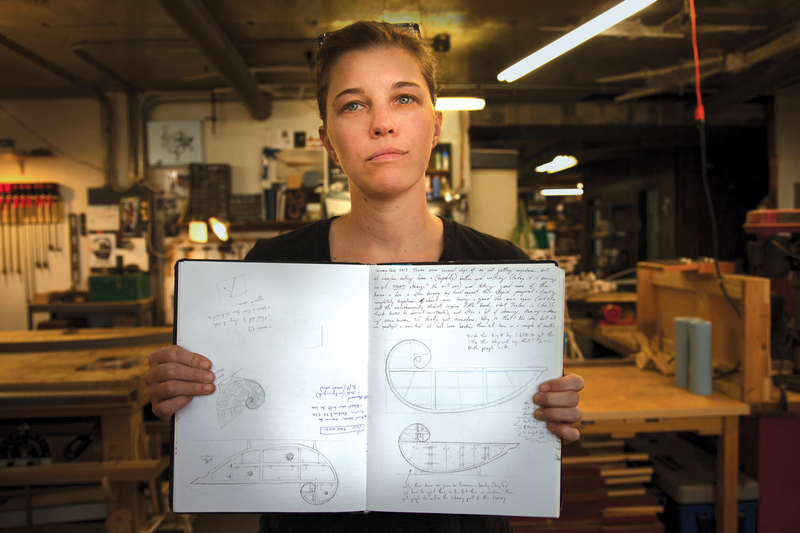 Equal parts bricoleur and woodworker, Katie Hudnall builds her fantastical creations, piece by piece. Published on Tuesday, March 7, 2017. This article appears in the February/March 2017 issue of American Craft Magazine. 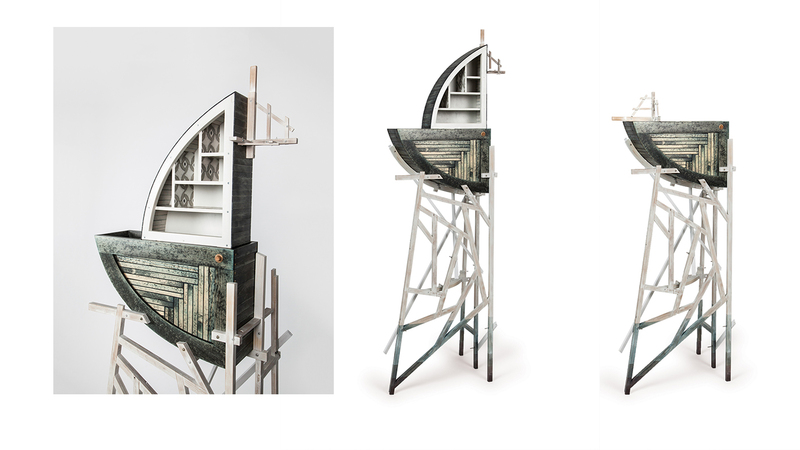 Inspired by the imaginative worlds of Edward Gorey and Jules Verne, plus down-to-earth farmyard architecture, Katie Hudnall creates art that is part furniture, part pop-up book. Katie Hudnall’s work has the same wonky logic and otherworldly beauty as a half-remembered dream. The artist, a prolific sketcher with a BFA in sculpture (Corcoran College of Art and Design) and an MFA in furniture design and woodworking (Virginia Commonwealth University), seems most at home in the interstitial realm that exists between genres. She has a category on her website called Furniturish, and indeed, it’s in the “-ish” that her hybrid creations of the functional and the fantastical seem to take flight. With aesthetic inspirations such as Edward Gorey – whose detailed pen-and-ink drawings evoke elaborately imagined (and deliciously macabre) worlds – as well as fabulists such as Roald Dahl and Jules Verne, Hudnall imbues her assemblages with similarly unexpected elements. Many are interactive – equipped with multiple portals, secret compartments housing tiny keys, Lilliputian vignettes, and telescoping arms that extend several feet. “I love that moment of opening something up – a door or a drawer – when the private becomes public, and you feel this shiver of surprise and delight,” she explains. Her surface treatments are no less intricate. The wood – much of it small, discarded bits rescued from dumpsters and gutted houses – is embellished with pen-and-ink drawings and layers of paint, creating finishes that impart antiquity, suggest decorative wallpaper, and even painstakingly add back the grain that’s been painted over. With such illustrative attention to detail, the pieces appear almost to have risen, fully formed, from the pages of her sketchbook. Which, in a sense, they have. Almost all pieces start as extremely detailed drawings, confirms Hudnall, 37, who had planned to study illustration as an undergrad before decamping to sculpture when she realized she could make the things she had been drawing. Finding clay too “smushy” and metal too hard, she had her “Goldilocks moment” as soon as her hands touched wood, although her affection was not necessarily reciprocated. Iverson laughs at the memory. “Once you understand how interesting Katie’s internal world is, and how rich her sense of humor, you long to see that made tangible. We gave her license to dip into that world, and after that, it was just magical,” recalls Iverson. 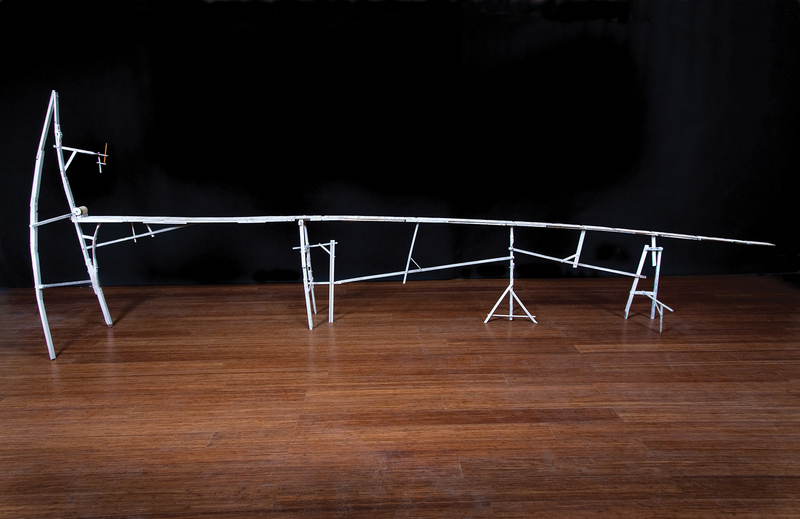 “One of her pieces, The World’s Longest Drawing Table, still makes me laugh out loud,” she continues, describing a somewhat zany, precariously long and narrow structure. 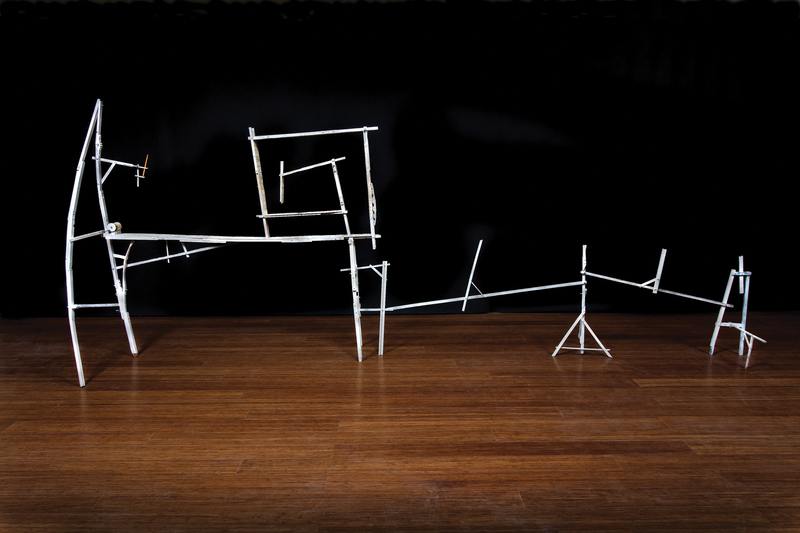 Wrought from two boxes of kindling, it puts its construction methods proudly on display. “There was a moment where I realized I could get much closer to my drawings – where I tend to accentuate connections rather than hiding them – by just using a band saw and bolts. Now all my joinery – and there are air quotes around that word – tends to be visible,” says Hudnall. After receiving her MFA in 2005, a move to her then-girlfriend’s family farm in the wonderfully named Bumpass, Virginia, further expanded Hudnall’s woodworking vocabulary. Refining her formal skills in a cabinet shop by day, she had a studio in one of the many outbuildings constructed by her girlfriend’s grandfather. A sail-like rigging animates A Half-Month’s Worth, Hudnall’s entry for a moon-themed show at Arrowmont School of Arts and Crafts. She made it in 2013, soon after moving from rural Kentucky – where she had lived in a converted barn and could see the Milky Way – to Indianapolis, where the only visible celestial body was the moon. Opening the smallest drawer compels a painted paper sail with the waxing crescent to open up; each successive drawer raises another sail. A rumination on the passage of time and one’s connection to the natural world, A Half-Month’s Worth was made in real time, as it were, with Hudnall finishing the illustrations at the end of the fortnight by the light of a full moon shining into her studio. It’s one of her many pieces with a connection to the sea, for which Hudnall has a deep affinity, having grown up near the Potomac River and spent summers in eastern North Carolina, where the houses are built on stilts as a flooding precaution. Shark Fin Cabinet (2014), whose fin-shaped curio shelving rises up and down, has bluish water marks painted on the bottom of its skinny legs, as if having been partially submerged. Sea Sloom (2009) suggests the hull of a boat in cross section, with hatches that open both up and out. “I was thinking about climate change, rising waters, and how a pedestrian might need a kind of teardrop trailer that could float.” A humorous way into a serious topic, Sea Sloom’s interior is painted with a pattern that evokes swirling tidal patterns. 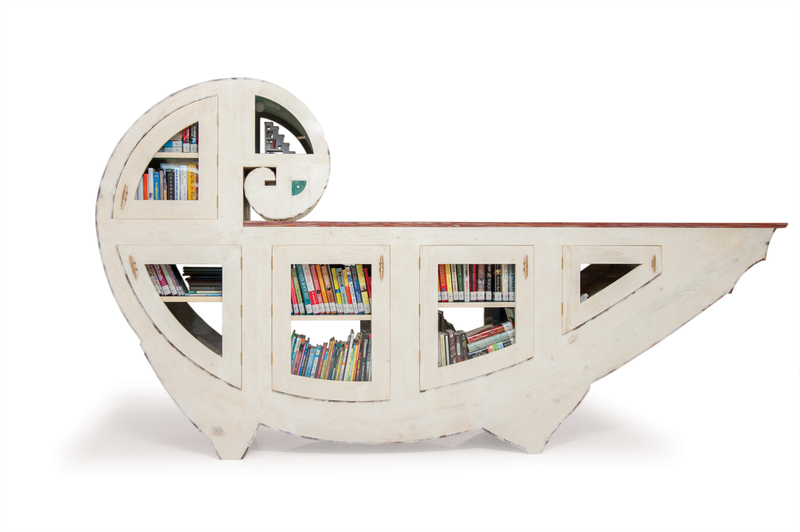 Another nod to the sea (and Jules Verne) is Nautilus (2015), part of a collection of scaled-down libraries made by local artists and installed around Indianapolis. Loosely designed after the image of a boat, Nautilus is berthed in a hospital, where its contents offer a means of escape to a happy realm. A tiny vignette is installed in one of the top windows, where a staircase filled with miniature books rises up to the moon – a bulb that lights up at the push of a button. “I’ve been drawing things that open, unfurl, and engage the viewer in funny ways for years, and I’m just now getting to the place where I can actually build them,” says Hudnall, reflecting on the challenge of not letting the difficulty of the process define the look. “I love pirates – for a lot of reasons,” Hudnall says, among them the way they cobble themselves together with peg legs, patches, and hooks. 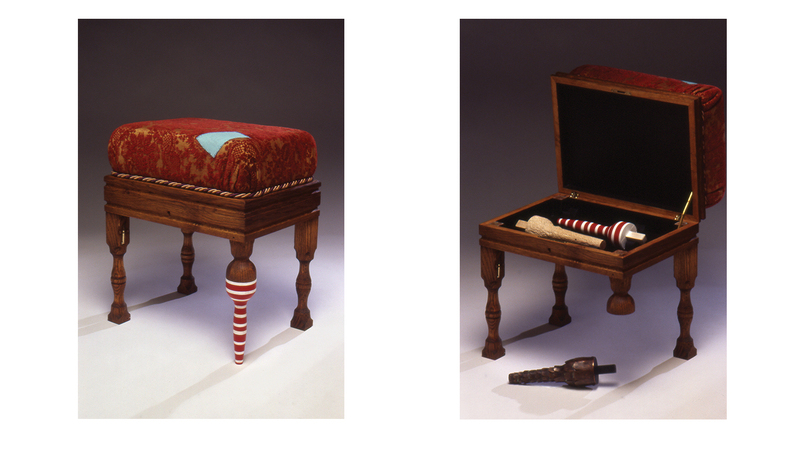 Her stool – or is it a chest? – contains a trove of legs for different occasions, including a striped pajama peg for bedtime. 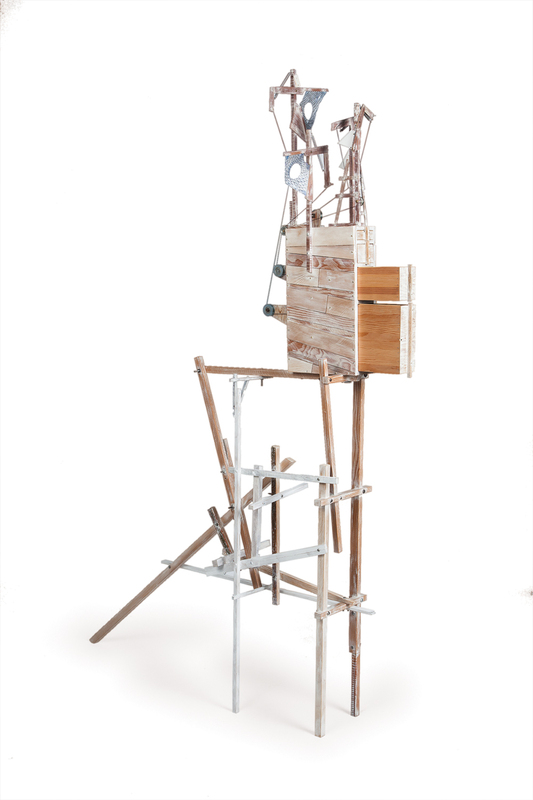 Shark Fin Cabinet, 2014, found wood, hardware, fasteners, ink, paint, dye, lacquer, wax, 5.6 x 1.7 x 1.3 ft.
Like the stilt houses on the beaches of North Carolina, where Hudnall spent summers as a child, this curio cabinet has tall legs that look as if they have been partially submerged. 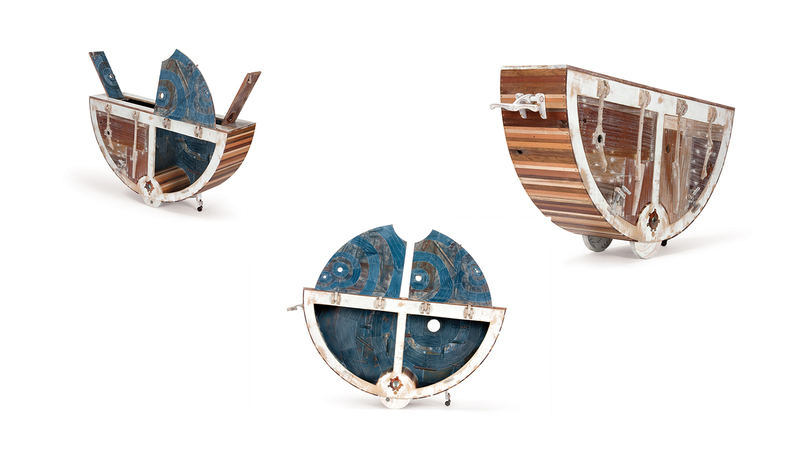 Sea Sloom, 2009, found wood, paint, ink, color pencil, lenses, lacquer, hardware, 2.5 x 5 x 1 ft.
A gentle, humorous way to take on the rising waters caused by climate change, Sea Sloom reimagines the hull of a boat as a trailer for pedestrians who might need one that can float. The hatches open both up and out. 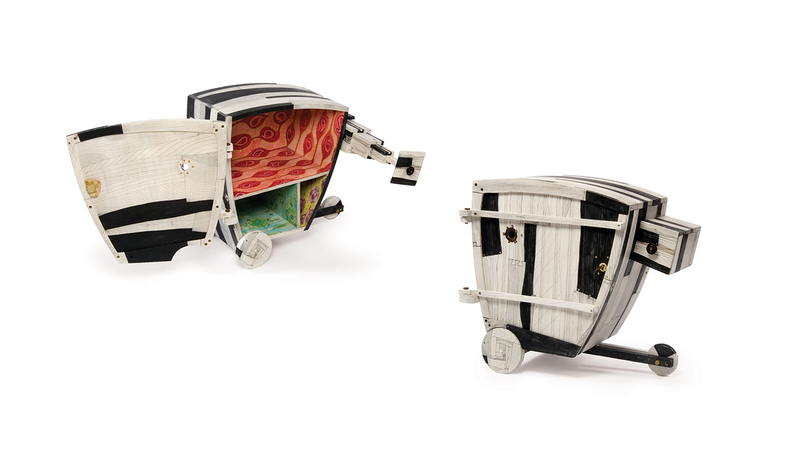 Cabinet With Sidecar, 2007, wood, metal, glass lens, paint, ink, pencil, lacquer, hardware, 2 x 2 x 1.25 ft.
Telescoping drawers hide a key to the main door, which features a peephole. This is the first time Hudnall painted over the grain on a piece and later redrew it, which, despite being tedious, made her giggle. A Half-Month’s Worth, 2013, found wood, hardware, paper, paint, ink, lacquer, wax, string, 5.7 x 1.25 x 3 ft.
Nautilus, 2015, salvaged wood, plywood, other wood, hardware, plexiglass, ink, paint, lacquer, wax, 6 x 10 x 2 ft.
Docked at a hospital in Indianapolis, Nautilus houses a lending library and a tiny vignette at the crest of its wave-like curl: A staircase full of books rises up to a moon, which lights up at the push of a button. Extending 10 to 18 feet, the structure is, at certain points, a mere 3 inches wide. “There’s a beauty about something that looks as if it shouldn’t be able to carry its weight: the scrappy underdog, defying expectations,” Hudnall says. Hudnall traded this custom lunch carrier, embellished with her signature watercolor and pen-and-ink drawings, for a bike a friend built. 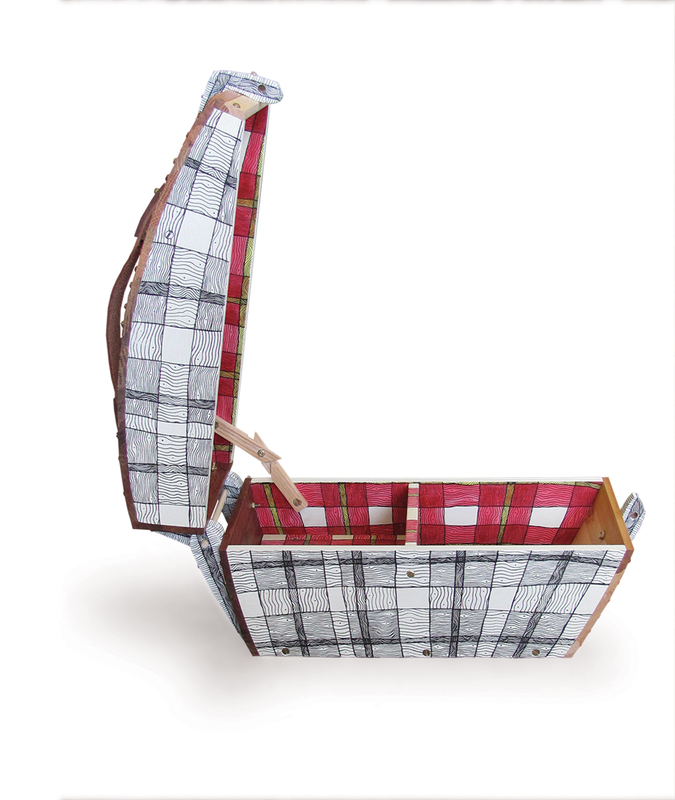 Naturally, the work includes a secret compartment.